Belize is a small country about the size of Massachusetts, with less than 400,000 people. Despite being one of the least densely populated countries in the world, Belize’s vibrant history has led to a diversity of culture, ethnicities, and language that is fascinating to experience. Belize was once the home of the Maya Indians. Historians believe these Maya disappeared around 1,000 years ago but some of their ancestors remain. The Kekchi and Mopan Mayas in the south, and the Northern Maya who have a Yucatec heritage. Belize also has a strong history of British and African cultures dating from the colonial period. This has led to a Belizean Creole culture. Many Central American based backgrounds from Guatemala, Honduras, and El Salvador, as well as the Spanish, have created a mix with Mayan Indians that is known as Mestizo. There is also a Garifuna culture that has African roots, mostly in southern Belize. Out in Cayo, Belize, you’ll find generations of German-based Mennonites who have made their way over from Europe and then North America, to make Belize home. You’ll also find a strong population of Chinese, Arab, and East Indian cultures here, too. There is also a healthy number of North Americans who now call Belize home. In addition you have many immigrants from all over Central America who now call Belize home. Each country brings with it its own culture and slight differences in the Spanish language dialects they use. This has led to a wonderful mix of so many languages, of which you will hear a wide variety just walking down the street. You will find Spanish as a main language in the north and west, and more Mayan and Garifuna language used in the south, and Kriol used everywhere. Kriol is a form of English that all Belizeans speak. Although English is the official language of Belize, almost all Belizeans speak several languages and can move in and out with ease. You can get by with English everywhere in Belize, the signs, documents, and all official paperwork is in British English. Local Belizeans will use Kriol with one another but will use English when speaking to a non-native. The Belizean accent is a fascinating Caribbean-sounding one that most people find very melodic. Even though the country uses English many words and phrases do not translate to the way North American speak. Some examples are, locals will say “He reached Belize City”—not “He got to Belize City.” If you are taking something with you, you are said to be “carrying” it with you. The word “soon” usually means shortly like today, in Belize this can mean next week. There is a strong population of Chinese throughout the country, dating all the way back to the days of indentured servitude under the British, to present day Asians who come because Belize offers a clear path to business ownership and residency. Most of the Chinese in Belize speak Cantonese. They own a great deal of shops like grocery stores, and this brings with it a vast array of Chinese goods, foods, and products. The East Indian population also came as a result of the historical indentured servitude, and now you can find an Indian presence in many parts of Belize from spice farms, to restaurants in every major town. Ambergris Caye has a growing Middle Eastern population where they own a great deal of hardware stores, grocery stores etc. There is also a Mosque in Belize City. The Mennonites in the west have a very fascinating history although they only started arriving in the 1960s, their impact on the culture in Belize is quite overwhelming. Out west, they are the backbone of the Belize community, the farming and construction skills they have brought to Belize have contributed to the feel and experience of the country as you can’t go far without seeing Mennonite cabins. It is almost a guarantee that the food you eat in Belize came at least partially from their farming. The Mennonites speak an array of English, Kriol, and some native Russian languages. Belize is the only Central American country that has English as its official language, and this has most definitely had a strong impact on its development. 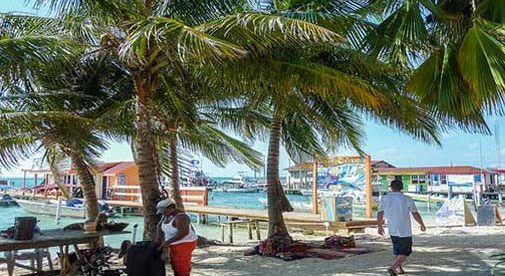 Belize is a great option for those who love the Central American culture, but want to be able to interact with locals, or even start a business. Although a former British colony, Belize is still in the commonwealth and Queen Elizabeth II is still on the Belize dollar. The country has British Law and the buying of real estate or the starting of a business feels familiar to the U.S. This is one of the reasons that despite being small and rustic Belize has continued to be high on the list for many North Americans. In Belize you are likely to feel very at home here the second you get off the plane. There is no transition period— you can find NFL every Sunday at a sports bar in the larger towns, and you can find plenty of North American culture in Placencia and Ambergris Caye—but just enough of the tropics so you know you are somewhere special. Where Should I Visit in Belize?